So, eventually, we have an enjoyable challenge, that I might have enjoyed more if I hadn’t nipped over to Fifteensquared to try to find the missing clues and spotted one or two answers. But never mind… The rest I found reasonably difficult, though not overly so, and as inventive as you expect when Punk’s on form. A few I didn’t understand, but lots of ticks as well. COD? 16ac – ‘Embarrassed, describing 3? (8)’. It’s an IoS reprint today, so nothing overly taxing. A little trouble with 14d (that I was pleased to get from the wordplay) and 25ac meant though that my time was, on the dot, par for the i. I don’t know how 18ac would have read back in the day, but it’s particularly neat now that she’s been promoted, rather surprisingly it would have appeared in 2012. I didn’t know the school referenced in 9ac, but luckily did know the cyclist. At 21d I spent far too long trying to justify EMMET. A little knowledge is a dangerous thing they say. COD? 7d – ‘Sparkle namely in work foreign character brought up (11)’. On the difficult side for Dac, I thought. It didn’t help that I’d not heard of 1ac (which I was convinced for too long was a partial anagram), or 21ac for that matter, and that it took me far too long to get 26ac. Lots to like as ever, of course, 7d being chief amongst the runners up. But COD goes to 14d – ‘Government agency recruits working class groups (9)’. Or the blog that almost wasn’t. I probably wasn’t on my best form Saturday afternoon what with one thing and another, but still, a handful of answers in the SE corner and nothing else wasn’t exactly the most auspicious of starts, and it looked like a rare run of successful solves was about to come to a juddering halt (OK, just about successful, let’s ignore that little slip at the end of last week’s Nimrod). So to Saturday evening, and start again, with a pint of Hobgoblin to ease the thought processes. To the preamble – some words that need to be changed to a “more contemporary version of one other (clued without definition)”… OK… Extra letters from wordplay in other answers tell us what we’re looking for. Sort of. That sounds like something we can cope with. We also have two unclued entries which hopefully a few crossing letters will sort out. Should we actually manage to get any. Thankfully my brain seems to have kicked into gear, after a bit of liquid refreshment, or perhaps more importantly with the kids tucked up quietly in bed, and the clues are starting to fall, albeit slowly, a quarter at a time. One of those where a corner of the grid remains resolutely blank until you get one and then everything around it falls into place. Those two unclued entries? They look like they’re going to be PARADOX, and THE SAME. To the entry that’s clued without definition. I’d like to say that I managed to crack the wordplay, but the truth is entries elsewhere gave me FTHESEUS – got to be OF THESEUS, then, hasn’t it? Google to the rescue. SHIP OF THESEUS across the centre of the grid. Wikipedia tells us that “The ship of Theseus, also known as Theseus’s paradox, is a thought experiment that raises the question of whether an object that has had all of its components replaced remains fundamentally the same object.” Of course. What to do about it? Most but not all of the clues have rendered an extra letter – the ones that don’t cross Theseus’s ship. As is almost de rigueur, at this point I realise I’ve made a mistake or two or three when the message those letters spell out proves to be… less than intelligible, so out with the rubber and try again now we’ve got something else to work with, to give us “SEVENTEEN NEW HEADS FOURTEEN NEW HANDLES”, which is apparently a quote from Only Fools And Horses. Trigger And that’s what I’ve done. Maintained it for 20 years. This old broom’s had 17 new heads and 14 new handles in its time. So that’s our modern day version of Theseus’s ship. 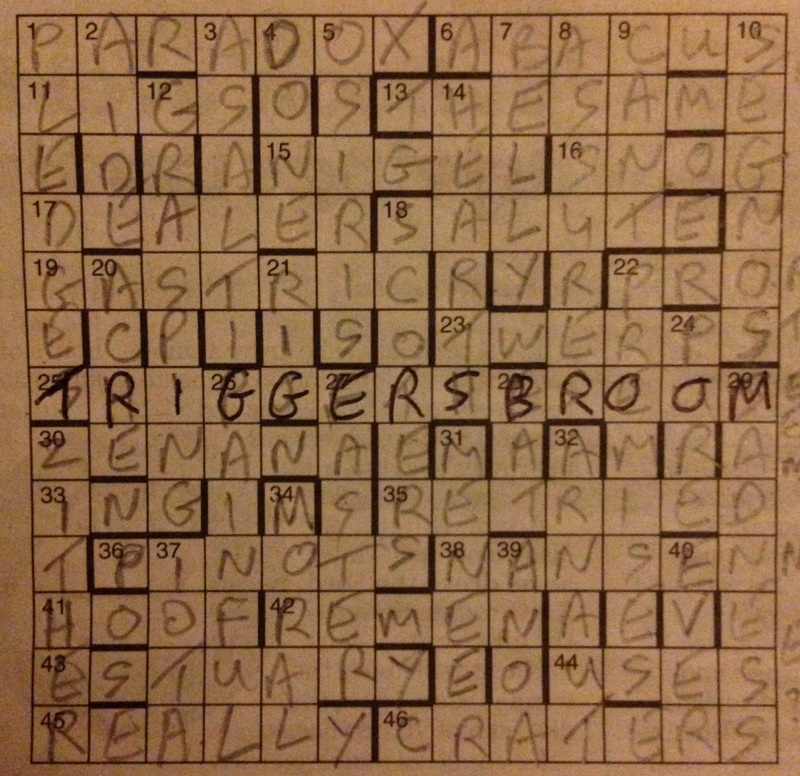 TRIGGER’S BROOM, with each of the crossing entries still forming real words. Huzzah! Until next time, then, and a green theme from Kruger to mark the start of Spring. A brisk, enjoyable crossword from Raich with a theme so blatant that even I spotted it. Not until near the end, mind you, and it seems that a couple of the Fifteensquared commenters managed to overlook it completely. Anyway, just in case anyone isn’t stuck with a tune which they can’t get out of their head, clicking here should sort that out. A game of two halves for me – the top half in double quick time, at which point I started eying up a personal best, before I swiftly ground to a halt to the south and staggered over the finish line at a time just under par for the i. I suspect the long anagram at 21ac and the new (to me) 18ac had something to do with this. Lots to enjoy as ever from the Don, COD going to 25ac – ‘Refuse van’s rear blocking entrance to Lincoln’. To October 2012, and an extended discussion on the merits, or otherwise, of setters also blogging puzzles. My own view, for what it’s worth, is that I don’t have a problem with it, as long as the relationship doesn’t become overly incestuous. ie. That there’s room for (gentle) criticism as well as praise. Another Saturday, another puzzle by Phi, and another Nina – this time TOPAND across the top and BOTTOM, well, across the bottom. Pretty trivial maybe, but it does provide a flurry of excitement when spotted, and a little rush of solutions afterwards aided by the checkers. Quite a few unfamiliar elements in the wordplay – particular =pet, person = pers, apparently = ap, library = lib, Latin bird = avis and triangular area = gore. Yes they’re all obvious once you’ve got them, but it did slow things up solving wise. No complaints though, just a regular enjoyable Phi. The Fifteensquared blog from 2012 with all the answers is here. The second puzzle from Donk and just its as good as the first that we had at the beginning of the month. Some very inventive clues and ingenious misdirection’s produced quite a few smiles and very few question marks. 17a was one query, I spell it eyeing although it appears either is fine and “Just for Men” I had forgotten about that and thought I was looking for the sort of magazines only found on the top shelf. 21a was another query until finding out what “tackle” was actually referring to then that question mark was replaced with a smile. Only one that I didn’t really like was 3d but that’s just a personal dislike of “Gob” and it seems a strange synonym for teeth. None of that though spoilt an excellent puzzle. A bit of a challenge today, as expected from a prize puzzle reprint. The top half more than the bottom, I found. The better educated will have spotted the anagram at 17ac quicker than I did, and may have struggled less in that area. Quite a few I needed Fifteensquared to clear up some bits with, but all seems fair and above board at the close. COD? 2d – ‘One demands Guinness? (7)’. Lots of ticks by the clues too, COD going to 19ac – ‘Area you shouldn’t enter, love, after a drink (2-2).